decided I did not want to be a teacher so I moved to Queensland where I was mentored by Raina Ham. Raina helped me get myself set up with tools etc and for a while I had a market stall and got involved with a community art group in Maleny to showcase and sell our work. I found it very hard to make a living and so for many years I made jewellery on the side whilst working as a cook, gardener, house cleaner and later on in health food shops and ironically as a teacher. 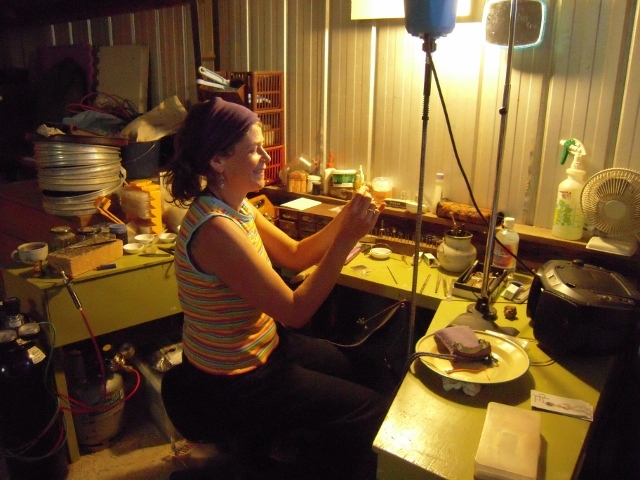 It wasn’t until my first trip to Yowah to set opal, in 2008, that I became a full time silver and goldsmith. I moved to Bellingen in 2010, after Black Saturday I could no longer live in bushfire country and I had always dreamed of living in a warm place. I chose to settle on this part of the coast because many of my opal friends also live here, including Ian ‘Mac’ MaArthur, whose shop and studio space I shared for my first couple of months in town. a lot of beading, I had my own 8 week beading course I taught at Community centres and Tafe around Melbourne. Once I discovered opal I stopped beading and concentrated on setting all those amazing works of art from under the ground. Each winter since that first trip I satisfy my itchy feet by going to the opal fields in Yowah, Koroit and White Cliffs to set opal for the tourists, miners, locals - anyone and everyone! I loved the lifestyle and people of White Cliffs so much that I moved there in August 2013. I now live and work in my dugout under the ground and have been creating a range of jewellery featuring opal, antique pottery and glass from the wonderfully inspiring palette of White cliffs.